Range: Southwestern United States to Argentina. 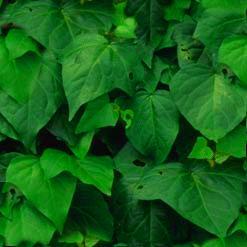 It can be found as far south as Patogonia. Also in the Amazon basin, Belize, and northern Guatemala. Habitat: Lowlands, forests, and jungles. Diet in the zoo: nutritionally complete meat diet. Location in the zoo: In the Brushlands of the Texas Wild Life exhibit beside the coyotes. Height: 2.5(30 inches) to 3 feet (36 inches). Body length: up to 4 feet (48 inches). Tail: Anywhere from 18-30 inches. Weight: females, 100-200lbs; males, 125-250lbs. Build: Stocky with sturdy, short limbs. Forest jaguars are darker, and are also considerably smaller in size..
Jaguars live a life of solitude which enables them to roam and learn the land. After mating, the male jaguar leaves the mom to raise the young and continues a life of solitude. Cubs stay with the mother for two years, getting lessons in hunting from mom. They learn what else lives around them and where to find good food sources. Although they reach sexual maturity at the age of three, they leave to establish their own territories at the age of two. A jaguar lives to be about 22 years old. Jaguars can be distinguished from leopards because jaguars have a more muscular looking body and a shorter tail. According to an Indian myth, jaguars got their rosettes by dipping their paws in mud and dabbing it on their coat. Principle threats to the extinction of these animals are deforestation, fragmentation of forests, competition for prey, and hunting. As the demand for their skin rises, they are poached more and are also sometimes killed by ranchers who fear that they will attack their livestock. Because this species is endangered, hunting of this animal is prohibited and is restricted to "problem animals." They have no protection in Ecuador and Guyana. Jaguars have jaws and a large head especially equipped for piecing the skull of their prey with their canines. They are the only big cats which practice this habit. Unlike other large cats, who attack at the neck, jaguars often kill their prey with a single bite to the back of the head. They are called "occipital crunchers." They are primarily nocturnal with activity levels high at dawn and dusk. Jaguars are exceptional swimmers to accommodate their living style. Because they may live in rain forests and flooded swamp areas this adaptation comes in handy when trying to cool off or catch food. Jaguars are the only "roaring" cat which also makes them unique from other large cats. 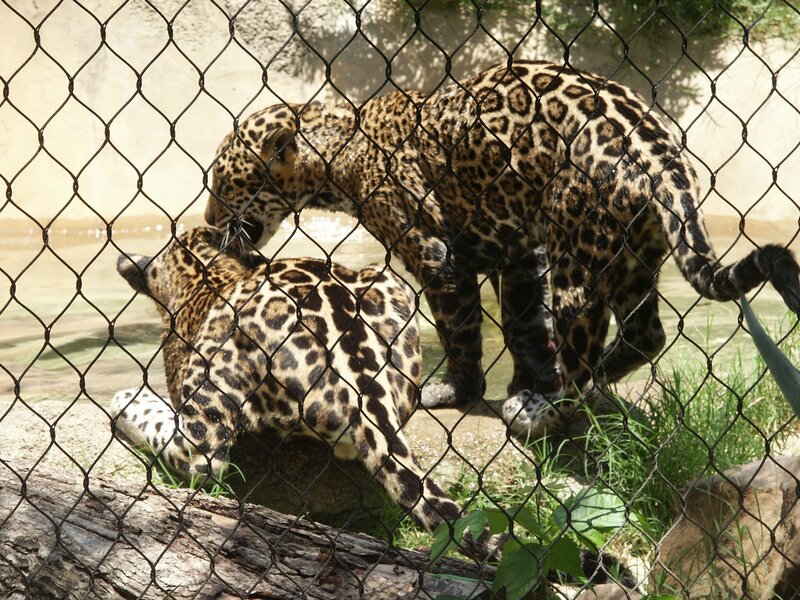 The jaguars were born in the Guadalajara Zoo in Mexico, and transferred via the Audobon Zoo in New Orleans. The male and female are not related, but are potential breeders. The female was hand-raised by her keepers, and seems to be more inclined to interact with people than the male. Even though the female was hand-raised, she is considered to be a wild animal and keepers take precautions around her. Their diet in the zoo is prepared by the Nutritional Services Department. Thursdays are fast days, on which they receive only bones. This is similar to their feeding habits in the wild. 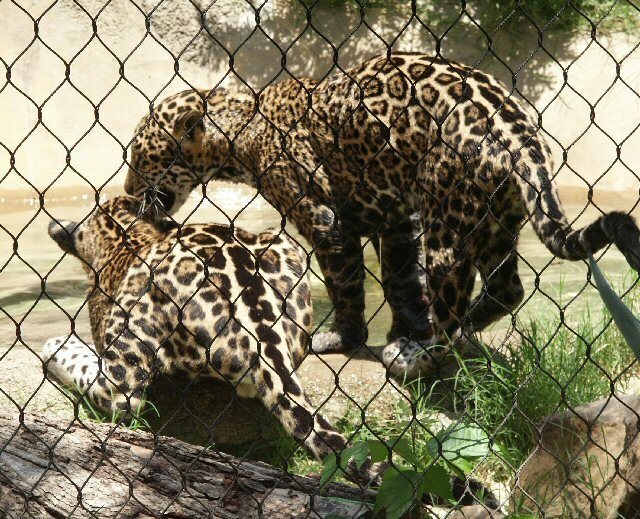 There are two jaguars at the Fort Worth Zoo. Sadly enough one of them has his/her front right paw missing. The reason the paw is missing is because it was bit off by another jaguar. When I went to visit them they were very active. They played with each other and engaged themselves into a serious wrestling match. The exhibit that they were in seemed really small for as large of an animal as they are. It was about the size of a small class room. Because these animals are typically hunters and roamers, I expected their cage to be much bigger. However the circumstances, they seemed to be two healthy happy. Freiderici, Peter, "Return of the Jaguar. (animals return to North America, not welcomed by all)." Vol. 36, National Wildlife, 06-16-1998, pp 48(4). Stacy Johnson, curator for Texas Wild!